Khyber Medical College (KMC), located near the Khyber Pass mountain range, was founded in 1955. Initially, the college was affiliated with nearby Peshawar University and had mostly guest faculty, including from King Edward Medical College (Lahore, Pakistan), Dacca Medical College, East Pakistan (now Bangladesh), The American University of Beirut and a professor/adviser from the University of Pennsylvania in the U.S. Over the years, it became successful in hiring and developing its own full-time faculty. 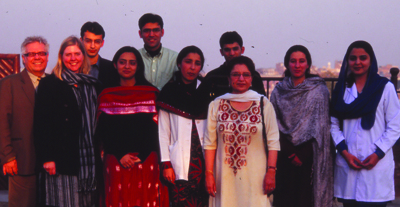 In the 1970s, KMC graduates working in North America started teaching programs at Peshawar. Dalhousie University’s medical school participated by sending audiovisual slide-tape programs followed by a lecture/seminar series at KMC. Dr. Mohsin Rashid, a pediatric gastroenterologist, and Dr. Arif Samad, an ophthalmologist, were at the forefront of this initiative. At the same time, efforts were made to upgrade the library at KMC, initially by donating major journal subscriptions and, later through Dalhousie medical students’ volunteer work to collect medical books from medical staff and sending a half-container load to Peshawar. In the 2000s, we started looking at revision of the KMC curriculum. The Aga Khan Medical Institute conducted workshops on medical education. Dr. Mohsin Rashid conducted a workshop on student evaluation. Following the success of these efforts, the International Health Office under the leadership of its director, Katie Orr, and the Department of Medical Education under the leadership of Professor Blye Frank became involved and made suggestions for revising the curriculum at KMC. A joint meeting was organized in Pakistan. In his address, Dr. Blye Frank outlined the role and responsibilities of a medical school towards its community. Katie Orr discussed the opportunity for collaboration between the two institutes, KMC and Dalhousie Medical School. The efforts at KMC were spearheaded by the Students Learning Forum (SLF). Student members of SLF made all of the necessary contacts and arrangements for social programs. Two student members who were prominent in their efforts were Usman Ahmad and Munaza Anwar. That evening a memorandum of understanding (MOU) was signed by representatives of the two institutes. The next day a workshop on medical curriculum was conducted by Dr. Blye Frank. To everyone’s surprise, practically all the faculty attended and participated in discussions. The afternoon sessions were in the form of an open discussion headed by Dr. Sultan Mahmood, Head of the Department of Medicine at KMC. With some modification, the revised curriculum was voted upon and approved by the vast majority (59 to 1). In discussion, it was apparent that there was lack of sufficient bedside teaching. Here, the SLF helped again. There was a nearby outpatient clinic that could be used for student teaching. It turned out that the clinic was constructed by the Canadian International Development Agency (CIDA). The problem was that the clinic belonged to the provincial government and KMC to the university. SLF arranged a meeting with the governor of the province. Katie Orr made a case to the governor who ordered that the clinic should be handed over to KMC students. While in Peshawar, we advised students to have a “Students’ Learning Centre” for first-year students to learn cardiopulmonary resuscitation (CPR) and other clinical skills. The KMC designated space for the centre. One more thing missing at Peshawar was that there was no rheumatologist; rheumatology patients were being seen by orthopedic specialists. However, one of the internal medicine specialists in Peshawar had shown interest in rheumatology. He was provided with rheumatology case histories and other teaching material. Three years later, he filled the role of rheumatologist and became well known in the city for treating rheumatologic conditions.